Isn't this face just punchable? You can practically hear the "ara ara" or "o~hohoho!" can't you? 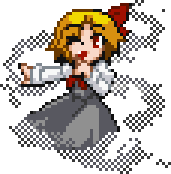 While in the games Rumia is nothing more than a mostly forgettable stage 1 boss, and as a character she's yet another person with short blonde hair, the EX Rumia fanon helps give her not one but three fully usable forms. Here, I'm going to be going over her Speed form and just why she's going to usher in the end of days. Standard attacking set. Her typing allows her to come in on a lot of things somewhat safely despite her average defenses (such as walls that just toxic you, Earthquakes/Spikes, Dream types in general), and start taking chunks out of enemies. Dream Eater should be your main attacking move because it helps mitigate her middling bulk somewhat, allowing her to take a startling amount of damage at times. Mistress is recommended to squeeze as much damage out of Giga Drain as you can, but a Nurse Uniform squeezes more damage out of PBomb and a Lum guards you from crippling paralysis. "But Aga, what about other things that aren't Doc, Kags, and Yumeko? Doesn't Sariel end you?" Shush I'm getting to that. The final moveslot depends mostly on the rest of your team. Toxic is the recommended choice, because you can throw it out there on stuff that doesn't care at all about the three main moves you pick. Shadow Ball works if you have Toxic covered already and want to kill Ghosts coming in, but most of them can be taken out through Toxic or are holding swords so they don't enjoy Flamethrower coming in anyway. Destiny Bond is Destiny Bond and can be a mean surprise, but it's better used ingame. If you do use it, try not to use a Salac Berry because it's painfully obvious and you'll just be killed by priority. As she doesn't get any natural boosting moves, ROOMIA greatly enjoys having Spikes at her opponent's feet while she's eating dreams and just generally being a pest. Ghosts that aren't weak to Fire-type moves, Steels and fast/bulky Reasons are the scariest things possible for ROOMIA to see. Dream Eater isn't enough to take out the bulkier Reasons (notably Tech Byakuren as you actually run into her) without Spikes, and any reasonably powered Reason STAB will be enough to OHKO her. Steels are worse as they aren't hit SE by her STAB options, and can come in for free on Poison Bomb. Special note goes out to Youki for being immune to both of her STAB moves, but be careful of coming in on Fire moves. Do note that none of those examples particularly enjoy coming in on her, bar Tenma. Be very careful of what you switch in on her if it isn't a Steel type - Poison Bomb has a 20% chance to inflict regular Poison (naturally) so it can slap on an additional 12% damage if it activates. Ultimately though, the best way to deal with her is to hit her. Hit her in her stupid smug face and make her run home crying. Smart ROOMIA users are more than aware of this though, and can pick teammates to absorb hits directed at her, such as a DKaguya or TToyohime of their own. Not much. She learns Hyper Beam, but I don't recommend it because there are more aggressive users of it such as Dark Alice and Speed Sariel and you guys run enough 120/80 moves as it is. If you have a huge Toyohime problem, you can fit Giga Drain into a moveslot, but ROOMIA does not appreciate taking Surfs. At this point I'm grasping, but Tickle can bully physical things coming in as you but that's Extremely Not Recommended. Heal Bell Benben should probably be mentioned as a full stop to any SRumia lacking Crunch. Ghosts that aren't weak to Fire in general give her a hard time.